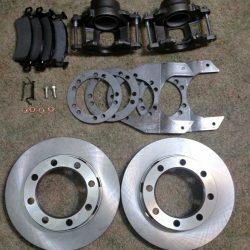 Upgrade the front OE brakes on your 1977 to 1991 Chevy Dana 60 with our disc brake upgrade kit! If you’re looking for a way to make your old truck stop better and faster – and more reliably – you’ve found it. Every Lugnut4x4 brake kit includes all the parts you need to upgrade your old brake system – all you need are the appropriate tools, brake fluid, and a little elbow grease. 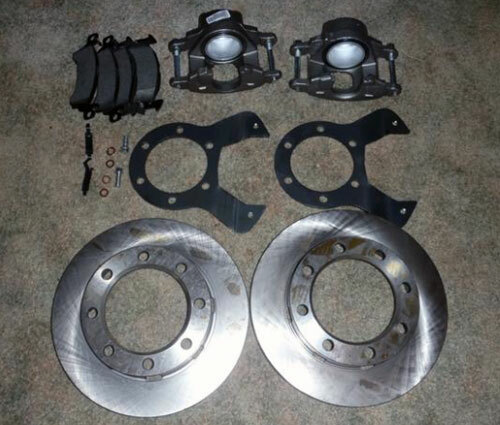 This Dana 60 axle brake upgrade kit is for 1977 to 1991 Chevy trucks. A new and improved design, our kit now works with all known aftermarket knuckles including Crane Knuckles. 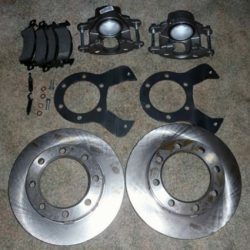 NOTE: This kit will not work with OEM Dana 60 rotors. Also, the bracket mounts outside the spindle, just like the original factory design. Kit includes instruction sheet and part number list, so that ordering replacement parts is easy. Anyone with a basic understanding of brake systems will find the installation simple.